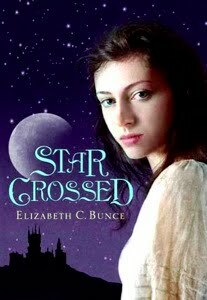 Starcrossed by Elizabeth C. Bunce. (Grades 7+) Arthur A. Levine Books, October 2010. Reviewed from ARC provided by publisher. Celyn Contrare has many secrets. First of all, her name is not Celyn Contrare. And she's not the daughter of a merchant like she's told the family that took her in. Celyn's real name is Digger and she's a runaway, a talented thief, pickpocket, and spy who's disguised herself as a lady-in-waiting to a daughter of a noble family. But as the winter wears on in their mountain villa, Digger discovers that she's not the only one keeping secrets. And as Digger learns more about the families wintering at the villa, she becomes more and more certain that something bad is coming. Caught between people she's growing to care for and a man who could have her arrested, which side will she choose? Starcrossed is definitely a book that you can sink your teeth into. I was immediately intrigued by the world - a place with seven moons, each representing a different god or goddess. At one time, magic was abundant and people could worship whichever gods they chose, but then the King started an Inquisition, arresting and torturing all who worship any except Celys. Anyone with magic is arrested and years before Digger's birth, the Sarists (worshippers of the goddess of magic, Sar) staged an uprising and lost. The plot is rife with political intrigue and everyone has a secret. Digger is adept at finding out these secrets, but the more she learns, the more complicated things become. For me, it was somewhat uneven. I felt like some parts of it dragged and there was so much going on, so many different families and characters, that it was hard to keep all of it straight. I thought the action-y parts were superb - I couldn't put the book down, but then there'd be a stretch where everyone was just planning things and it would slow down again. I think it's a wonderfully rich and complex book, but it's definitely a book that takes some commitment. I'd recommend Starcrossed to fans of Shannon Hale and Kristin Cashore. It especially reminded me of Kristin Cashore's Fire with its concentration on political intrigue. Starcrossed will be on shelves October 1. Oh man, I'd love to get my hands on this! I really loved Bunce's first book. I was just looking at this on Goodreads a few minutes ago when I came across your review! I'm definitely looking forward to getting it because I loved Curse Dark as Gold.